The Great Zapfish is the main subject of Splatoon's single-player mode, Octo Valley, being a very large Zapfish that powers all of Inkopolis. 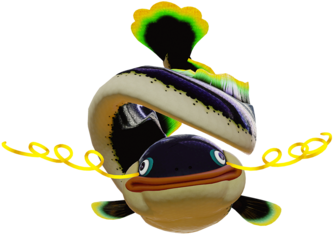 Unlike other Zapfish, the Great Zapfish is massive and more similar to the real-life electric catfish. It has yellow curled whiskers that give off electricity, an orange mouth, peach face, a dark blue body, a small, dark blue tail with lime green along the edges, and similarly colored fins. The Great Zapfish in Inkopolis Plaza. The Great Zapfish is a giant animal circling Inkopolis tower, powering the city. According to the first Sunken Scroll, The Great Zapfish is 100 years old, and powers the entirety of Inkopolis. However, when the player enters Inkopolis Plaza for the first time, a news report turns on stating that the Great Zapfish has been stolen, and is believed to be linked to the UFO that crashed earlier outside of the city. However, when the player goes to Octo Valley for the first time, Cap'n Cuttlefish, a veteran of the Great Turf War, tells the player that the Great Zapfish has been stolen by the Octarians as an act of revenge for losing the war. Cuttlefish teams up with the player so they can take back the Zapfish, but first the player must take back every regular Zapfish before obtaining the Great Zapfish. After collecting all regular Zapfish, the player finds the Great Zapfish in the hands of DJ Octavio, leader of the Octarians, who baits the player into saving it before sucking it up into his weapon. After defeating Octavio with the help of Agent 1 and Agent 2, the Great Zapfish is saved, and can be found resting on Inkopolis Tower for the rest of the game. As the player enters Inkopolis Square, a news report is cast by Pearl and Marina informing everyone that both the Great Zapfish and the Squid Sister Callie have gone missing. After going to Octo Canyon for the first time, Marie explains that Callie and the Great Zapfish have been taken by the Octarians. The player is given a handed down Hero Suit and joins the Squidbeak Splatoon as Agent 4. The player goes through a series of levels, obtaining both regular and mini Zapfishes along the way. After completing all levels, the player defeats DJ Octavio in a final boss fight. With the help of Sheldon and Marie, the player defeats DJ Octavio and saves Callie and the Great Zapfish. After the player defeats DJ Octavio, the Great Zapfish will be on the Deca Tower, on the tracks above Grizzco, or flying around. The Great Zapfish can be seen coming up from the water around Piranha Pit occasionally in both Splatoon and Splatoon 2. The Great Zapfish is not present on Inkopolis Tower that can be seen from Inkopolis Square in Splatoon 2. The Great Zapfish can be seen on top of the train railing behind Deca Tower in Splatoon 2 and is sometimes also seen flying above Inkopolis Square. A sound effect will play when the Great Zapfish is flying in the air. After the Splatoon 2 version 2.0.0 update, many players reported the Great Zapfish missing in Inkopolis Square, even if they had already completed story mode. This was patched in a later update. The Great Zapfish also appears as decoration on the Zapfish Satin Jacket. The Great Zapfish and a jellyfish in a raft at Piranha Pit. The Great Zapfish in the level Enter the Octobot King! in Splatoon. The Great Zapfish in the front of the Zapfish Satin Jacket. The Great Zapfish in the back of the Zapfish Satin Jacket. This article or section is incomplete or is missing information. You can help the wiki by filling in the blanks. This page was last edited on 9 January 2019, at 03:21.